Direct democracy can also be used for decision making processes. 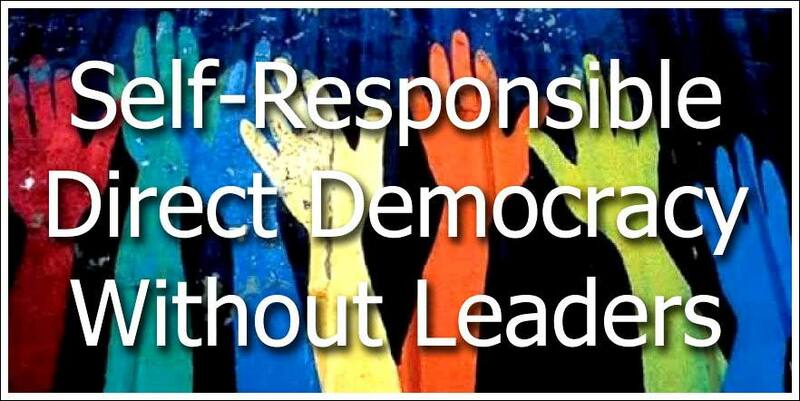 The way we implement direct democracy on Vegan Hills is a “Self-Responsible, Direct Democracy Without Any Leaders”. they are willing to be fully responsible for their actions. assertive. And we need rules/regulations mostly to live in peace with the outside world. No one has to take on responsibility for others. No one has to take care of things that do not personally concern / interest them. No one is ruled by others (heteronomous). No one needs or has to fight for their interests. Everyone can participate in decisions by a simple vote. Avoidance of conflicts and focus on a functional social life. Groups in this system are free to have their own system (like sociocracy). Unlike all other democracies (direct or representative) we have no representatives. Everyone represents themselves. Too little participation from only a fraction of people leads to both power concentration and emotional burnout in those who do participate. All minutes and notes accessible to all members. We don’t want separatism within working groups. Whenever there is a disagreement in the community that cannot be resolved through conversation, we have a vote. Our definition of direct democracy makes this decision making process fast, flexible, easy to understand and transparent. A direct democracy ensures that everyone is equally powerful as everyone else, online or offline. Every vote carries the same weight. People who don’t like to talk / be the center of attention / are not very assertive (A) can still influence the decision making process just as much as people who talk and do a lot (B) – and who could otherwise overpower the former (A), simply by being louder / more assertive / more aggressive / by ignoring (A).